Question: A client who was traveling for the holidays stayed at a luxury hotel in Miami. She used the hotel’s VIP butler services. As she prepared to leave, the butler packed the trunk. She locked it in the presence of several other persons and did not unlock it until she arrived, by private jet, at her next location, where she discovered expensive clothing and jewelry were missing, about $35,000 worth. She began to wonder: Is this the only luxury hotel where something like this can happen to its guest? Or should one consider this a regular risk? Answer: You know this line is coming, but it must be said: Crime never takes a vacation, and it visits some of the best-known resorts and hotels. A luxury hotel may give a false sense of security, experts told me, but one needs to exercise caution anywhere that’s not home. Yermak said in his original letter that the butler had admired this woman’s clothing, but this isn’t a murder mystery, and saying the butler (or maid) did it may be unjust. The better hotel room locks will show who last entered the room, which is almost always going to be the person responsible for providing service, but they don’t tell the whole story, said Kevin Coffey, a veteran of more than three decades in law enforcement and founder of Corporate Travel Safety, which counsels business travelers. Indeed, bad guys (and gals) can easily make themselves at home in your home away from home with a slight deception. 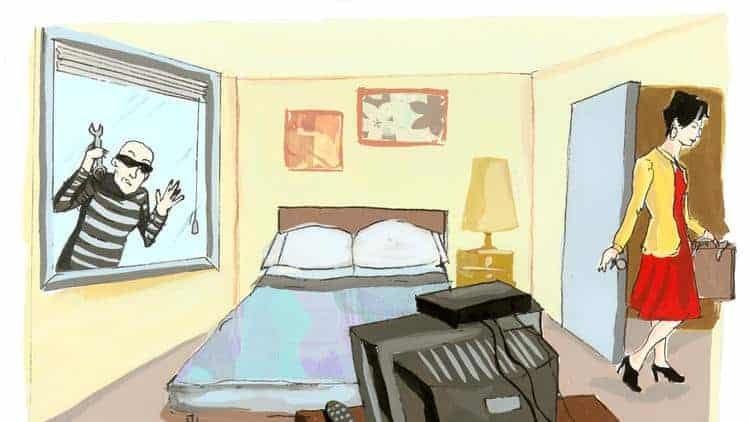 One of the tricks of the burglar trade, Coffey said, is effective and easy: A thief will breeze in while the housekeeper is cleaning and say, “Oops, forgot my (fill in the blank). Just have to grab it.” What the scoundrel is grabbing is your laptop or camera or phone that’s in plain view. That’s where the hotel safe comes in. Those safes are mostly electronic these days and are larger than in years past so you can more easily store a laptop or camera, said Mark Sullivan, travel editor for Fodor’s multiplatform guidebook information. But, Sullivan noted, hotels sometimes will say that they’re not responsible for items left in rooms. The hotel’s front desk usually has a safe that may be, well, safer because there’s almost always someone there. That’s a good place for those things you absolutely cannot afford to lose such as passports, said Nick Thompson, a retired law enforcement officer from West Sacramento and chief executive of Patrol Service International, based in Bend, Ore. But you’re not going to stuff a ball gown in a room or front-desk safe (think of the ironing that would ensue), and the only real way to secure such items, all three experts said, is in a trunk with a good lock and perhaps a cable wrapped around it and secured to an immovable object. The best way to keep your possessions safe? “I’m a proponent of not bringing anything of value,” Thompson said, adding that the deterrents designed to thwart them are not foolproof. Because reimbursement policies vary from hotel to hotel and state to state, if you do have something of value, take a picture of it and time-stamp it — a “proof of life” photo, as it were — so you can at least prove you had it with you, Sullivan said. Thieves and dishonest hotel employees are a small percentage of the population, Coffey noted, but it takes only one to ruin your vacation. By taking precautions, you won’t put them out of business, but they’ll take their business of finding new inventory elsewhere. Have a travel dilemma? Write to [email protected]. We regret we cannot answer every inquiry.